The views expressed in this blog are solely those of the author. It’s amazing how just a one-degree turn off course made at origin can put you miles away from your final destination. Pilots may know this reality as the 1 in 60 rule – a rule of thumb which states that every degree off course over the length of 60 nautical miles will cause a displacement of one nautical mile. Imagine making a one degree error for a flight of 2,451 miles (roughly the air travel from Los Angeles to New York). By the time you land, you would be approximately 40 miles off course. What if the turn was more than one degree off? Potentially you could be over a hundred miles from your target destination at journeys-end! It’s said, even skilled pilots cannot fly manually within 2 degrees of a target heading, so sophisticated auto-pilot systems are needed to maintain course, and allow pilots to communicate with air traffic control. Fortunately for us passengers, because of these tools we rarely, if at all, have to worry about our flights arriving at our desired destinations. …but the task to deliver large-scale oil and gas projects to final destinations doesn’t come with auto-pilot tools. Now more than ever, operators are tempted to commit to rigid ‘flight paths,’ or development solutions, early in the project lifecycle. These offers are billed as “packaged solutions” or one-stop-shop contracting models. They often come with cheaper price tags, or no price tags at all for the engineering and evaluation to set the direction of the project. Thus, these solutions undervalue unbiased and independent engineering consultancy, leaving operators to later look back and wonder why crucial initiatives are routinely road-blocked. What might sound ‘too good to be true’, more often than not results in cost overruns and schedule delays. For example, a recent development for an LNG project accommodated this type of groupthink, ignoring reservoir uncertainty and ignoring project layout. This led to significant operational problems and resulted in project start-up delays and poor economic returns. Another offshore development ignored the impact of fluid properties in the subsea and topside designs, which also impacted operations and maintenance activities (hydrates, wax, and corrosion). This resulted in a longer and more expensive FEED phase and re-work for most of the concept definition, as well as major changes to the selected concept with major delays to project schedule. In a third example, site specific characteristics, such as water depth, metocean conditions, and bathymetry, were only assessed on a preliminary basis, resulting in a major project delay and cost overrun for the FEED phase. So what tools can be used to avoid these predicaments? Is it possible to adopt our own ‘auto-pilot’ system to keep projects on track and facilitate flexibility for optimal production down the line? One degree mistakes made on the front end equal costly repairs and major modifications further down the road. 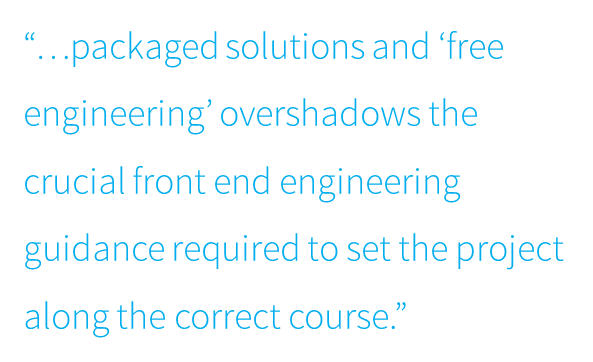 These mistakes are often made because the lure of CAPEX and advertised OPEX savings from packaged solutions and ‘free engineering’ overshadows the crucial front end engineering guidance required to set the project along the correct course. Projects in our industry require intricate planning from the start, and depreciating the value of engineering can push projects squarely off course in the latter stages of development. FREE is a term which, in our industry, is commonly time sensitive. Free engineering now more often than not results in EXPENSIVE rework and delays in the future! Will Collaboration Suffer When the Market Returns?